I am a Toybank volunteer who lives in the United States. I just finished my freshman year in high school. My relatives live in India and my family visits them every couple years. This summer was one of those years. I had very little idea of what India would be like, as I hadn’t visited India in a long time. Back in the Unites States, I had a job that I loved. I was an after school teacher at one of the local elementary schools. My job was to play and interact with kids, teach and help them with homework. I had to supervise the kids to make sure they didn’t do anything wrong or bad, and to correct them if they did. The job was fun because I think it is very important for all children to get an opportunity to build happy lives. I always wanted to help more children though. There are millions of children who are underprivileged in the world. So I thought of using my summer vacation to find something to do where I can further my cause and in turn help the community. This is when I found Toybank. It had a great message: “It is easier to build strong children than to repair broken men”. I took a look at their website and it said that they help 38000 children lead better lives. I was impressed and decided to sign up as a volunteer for Toybank. So, here I was in Mumbai, India to spend my summer months with under privileged children. 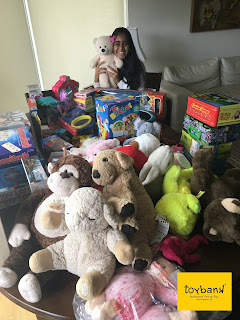 I had many amazing experiences while volunteering with Toybank but there were three that really stood out to me. One of them was my meeting with the Toybank CEO Shweta Chari. On my drive to the Toybank headquarters, I was nervous, I didn’t know what the experience would be like to meet a CEO. I had never met or interacted with a CEO of a company before. I expected the CEO to be a very serious and strict person. Instead, she was the absolute opposite. She was nice and friendly, which helped to ease my anxiety a lot. At the meeting, she explained to me and my parents with an elaborate presentation what Toybank was all about. She also talked about the kids helped by Toybank, the different volunteer opportunities for me, etc. I was impressed by her humble nature. I made a mental note that great leaders / CEOs are so humble even after they have achieved so much in their lives. 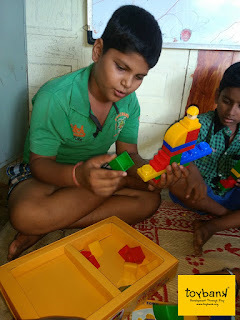 I participated in several play sessions with underprivileged kids as a volunteer for Toybank. But, my first one was the most special, the play session with the kids who live in the slums of Mumbai. My expectation was that the place would be really bad. And I was correct, the slums were awful, I couldn’t believe these kids would be living in such conditions for most of their lives. The roads were cramped and cluttered, the homes falling apart, the whole place reeking of a terrible smell. I felt really bad for all the children that had to suffer through all this every day. Sadly, the kids didn’t even have a proper play area, as it was demolished by the rains. So, we decided to do our play session in the local temple. The children were all very happy to even get to play. They were all screaming and jumping with joy. I was so shocked to see all these kids enjoying the play even in conditions like this. I didn’t expect any of this. I really enjoyed that play session because it showed me that you don’t have to be rich to have fun. I was impressed. The thing I took from this experience was that it’s up to us to play and have fun in life without getting impacted by the environment around us. These children had no expensive toys, no air conditioned play area, no iphones, ipads, etc. but they were having loads of fun and were HAPPY. Back in the US, I have seen children having everything they can ask for but still are unhappy, sad and complaining a lot. To get a deeper and broader understanding of how difficult it is to run an NGO, I worked in the back office of Toybank. I did the inventory, sorting and checking toys and games in Toybank’s “sorting center”. The experience was very unique. My expectation at first was that this type of volunteering would be easier than the play sessions, but that myth was quickly shattered when I learned that inventory sorting had its own unique challenges. The volunteers who work in this inventory have one of the most important roles. They have to check and make sure that all toys are working and proper, discarding broken toys. This is a very tedious job but also very important. If the children don’t get working toys to play with, it might not go well for the children. Along with this, they have to sort the toys into different categories such as strategy, general, etc. I realized that to organize the play sessions with kids, there are many people working behind the curtain. I realized that there is generally more to running an NGO than what meets the eye. Anytime someone travels to a foreign country they are bound to face challenges, that’s just the nature of the world. Sometimes, the challenges are small, but sometimes they take lots of hard work and adapting to overcome. The challenges that I faced in India were tough, but they made me a much better person, and taught me that ability to quickly adapt to changing circumstances is a very important life skill. For example, living in the United States, I didn’t know much Hindi at all. I could speak short phrases but that was about it. So, it was a challenge to communicate with the Toybank volunteers and the underprivileged children. Throughout my stay in India I learned more phrases and words in Hindi, so I could have a basic conversation with almost anyone there. I also grew accustomed to speaking “Hinglish” a mixture of Hindi and English to fully communicate with the volunteers and children. In addition to the language, the overall culture in India was a major shock to me. India is a nation that thrives on chaos. For instance, nobody really follows the traffic rules in India. Anywhere you go there are people driving on a red signal, not following lanes, etc. The first few days I was shocked by this and I was frightened. I thought that if people are not following rules, many accidents will happen. But somehow in all this chaos things just worked fine. It felt like there was order in chaos and things always worked out. Over time, I realized that there was nothing to worry. The people in India are very alert and somehow avoid accidents. This environment makes Indians prepared to face any situation. Actually, I started to respect that quality in all Indians. Another example of a challenge is the amount of pollution in India. There are various types, noise pollution, water pollution, air pollution etc. I was so scared that I did not want to leave the apartment. But, I noticed that the millions of other people living in the city were not falling sick, or bothered from any of the pollution. This is when I realized that if it isn’t bothering them, why should it bother me. I learnt to adjust to the new environment. Throughout my stay in India, I learned many life lessons. I developed a broad perspective and it’s always good to get global exposure. Most people from developed countries never visit developing countries in their lives, because they feel that it is unnecessary. Therefore, I am one of the few westerners who has seen both sides of the world. I feel like I now have appreciation for things which I used to take for granted. We have to be grateful for what we have and always be happy because there are people in this world who struggle for basic necessities of life. This trip to India has taught me to be more thankful and humble in life to god, men and women of all backgrounds. At last, Indians have me taught to always persevere and never give up. A lot of Indians face setbacks in their life just because of the country and environment they are in. Yet, they don’t give up, and they still strive for their major life goals even after setbacks. From the kids who live in the slums, to the CEO of Toybank, to my own relatives. I have never seen anything like this to this degree anywhere else on the planet. In conclusion, India has really changed the way I look at things and has taught me many valuable ideas and life lessons.